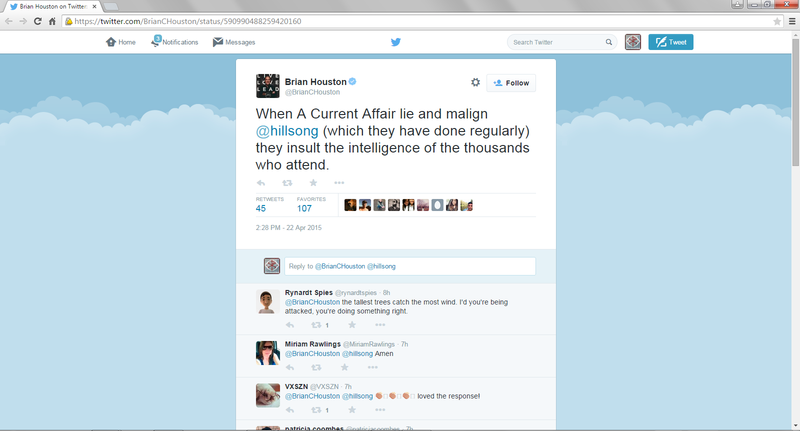 Home › Hillsong › Brian Houston in damage control… again… and again…and again. Nick Xenophon has been quite vocal for years about addressing cults and religious movements and their impact on families. What is the difference between Rick Xenophon and Reverend Bill Crews in their appeal for truthfulness from these ministries making mega millions of their “flocks” while their leaders lead lives of luxury and comfort in a very rarified atmosphere? Did the Reverend Bill Crews miss out on an attack from Brian Houston because he (Brian Houston) operates under the false teaching of “not touching the Lord’s anointed” (Reverend Bill Crews)? It’s a mystery yet to be answered. Seriously now, it is time for Hillsong supporters to STOP responding via reflex emotional responses and time to START seriously studying whether what is being said is true or not. Jesus said love God with all your *MIND*, not just your heart, soul, strength (Matthew 22:37)- he did not say (as Hillsong claims) your wallet. IIf these Churchwatcher websites are so wrong you should have no difficulty *via factual evidence*, and/or bible verses (especially New Testament) *in context* that Hillsong church is beyond reproach. Please Hillsong supporters – for your own sake – open your bible/bible website, it is time for you to think for yourselves and *carefully* examine whether what is being said by ANY Christian lines up with scripture or not. Learning to discern the difference between right and “almost right” is an essential part of growth in Christian spiritual maturity. They’re a really sensitive mob, aren’t they? It seems they don’t subscribe to the idea of turning the other cheek – perhaps they’ve had too much exposure to Brian’s messiah complex and triumphalist “preaching”.